Characterized by their unique creamy white color, belugas have an extensive vocal repertoire and have long been called the "sea canary" by seamen who heard their myriad sounds. Communicative and emotive calls can be divided into whistles and pulsed calls. As many as 50 call types have been recognized. Much smaller than many of their cousins, beluga whales average only 12 feet in length and weigh about 3,000 pounds. They have relatively small heads, tails and flippers, and lack dorsal fins. Their prominent dorsal ridge can be used to break through thin sea ice. Calves are born a grayish color that quickly turns much darker. The melanin in their skin gradually reduces over time, causing them to become paler with age, finally reaching their familiar creamy-white color upon sexual maturity. Belugas thrive in cold waters thanks to an insulating layer of blubber that can be as thick as 6 inches. Their prominent dorsal ridge can be used to break through thin sea ice. Swimming at a steady speed of approximately 2 miles per hour, belugas cover thousands of miles every few months. Belugas include in their diet a wide variety of bottom-dwelling and open sea prey . 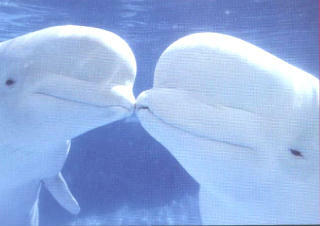 In some areas, belugas feed near the coast on seasonally abundant coastal fishlike salmon, herring, capelin, and smelt. Their unique, flexible neck allows a much wider range of motion for foraging the ocean floor than other cetaceans. Although belugas are sometimes seen singly, they more commonly occur in groups known as pods. Pods typically number 2-10 whales, but sometimes aggregate to form herds of several hundred to more than 1,000 whales. With the exception of the tight pairing of adult females and their newborns, stable associations are fairly rare in belugas. Group structure generally appears fluid as individuals readily form and dissolve brief associations with other whales. Females become sexually mature at age 5 and males at age 8. Females bear a single calf between late spring and early summer after a 14-14.5 month gestation period. Mothers nurse their young for up to 2 years. By 1999, the beluga whales of Alaska's Cook Inlet had declined to only 350 animals. Victims of over hunting, they stand little chance of recovery without complete protection under the Endangered Species Act. Increasing levels of human activity in the beluga's environment carry the risk of disturbance, pollution, and habitat destruction. There also is concern over the environmental and health risks associated with the development of drilling for oil and gas, or mining, in the Arctic.